Students will be able to produce and expand sentences to share ways that they can help the earth stay healthy and clean. Gather students together and project the clip “We Are All Earthlings” from Sesame Street. After the song is finished, ask students to close their eyes and think about the song and how it made them feel. Allow 2-3 students to share their feelings about the song. Display the cover of the The Earth BookBy Todd Parr. Ask students to turn and talk with a partner to share what they think the book is about. Invite several students to share out their ideas. Explain or review that we all live on a planet called Earth. Then tell students that today we are celebrating a very special holiday that is called “Earth Day.” It is a day to celebrate the earth and think about how we can keep the earth healthy for all the plants, animals, and people who share it. Read aloud The Earth BookBy Todd Parr. Ask students to think about all of the ways that we can help the earth. Record student ideas on the whiteboard or chart paper for students to reference. Explain that students will now choose one of the ways that they can help the earth and will get to finish a SentenceAnd draw a picture to share their ideas with others. Tell students that all of the finished worksheets will be turned into a class book. Remind students that when they are writing there should be spaces between each of their words and they should practise stretching out all of the sounds they hear when writing their words. Refer back to the list on the board for students to use as support in their writing. Pass out the I Can Help worksheets to each student. Provide students with index cards containing pre-written words about helping the earth from the read aloud. They can use the index cards to help them complete the worksheet. 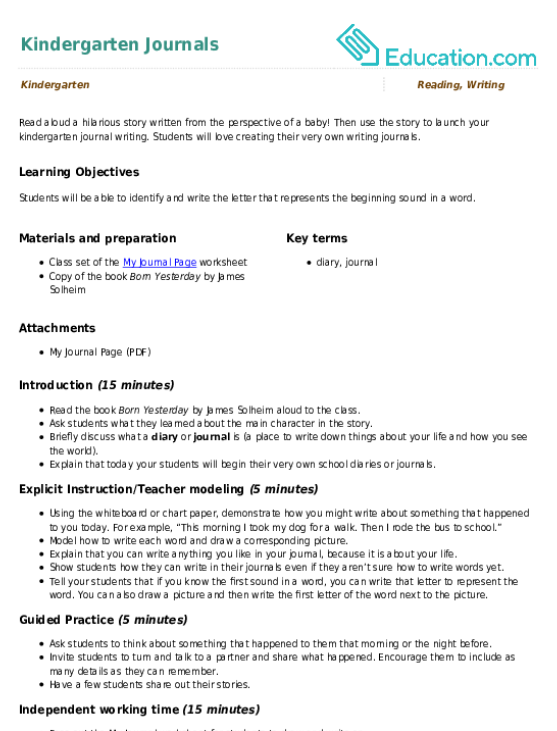 Provide students with a copy of the Earth Day Mini Book to complete. Collect student work samples to assess if students were able to complete the sentences with a relevant answer while also creating space between words and using invented spelling to record the sounds in each word. Gather students together and have them go around and share their completed sentence with the class. Explain that you will be putting the finished worksheets together to make a class book. End the lesson by inviting students to share the book with their family and friends when they visit the classroom. It’s time to celebrate Earth Day! 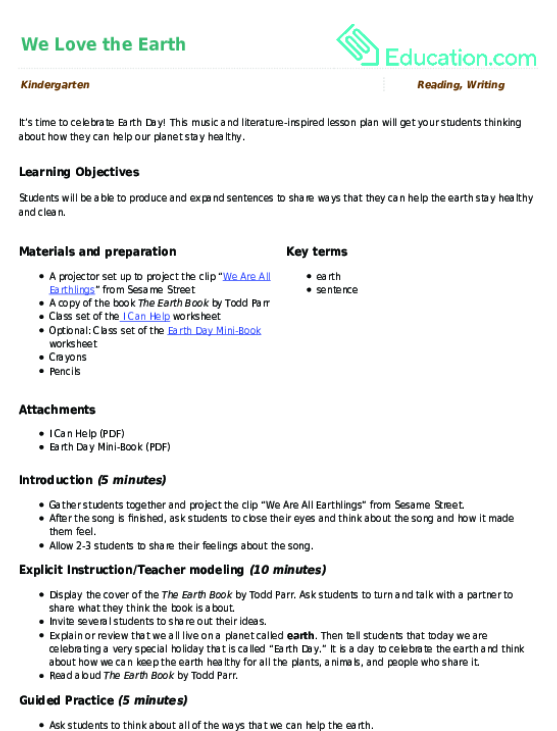 This music and literature-inspired lesson plan will get your students thinking about how they can help our planet stay healthy. It’s time to celebrate Earth Day! Use this fun art and writing lesson to help your students deepen their appreciation for all that the earth provides. How can your year one students become stewards of the planet? Use this worksheet to help them think about how they can help the earth as they celebrate Earth Day! Your kindergartener will love creating their very own journal! 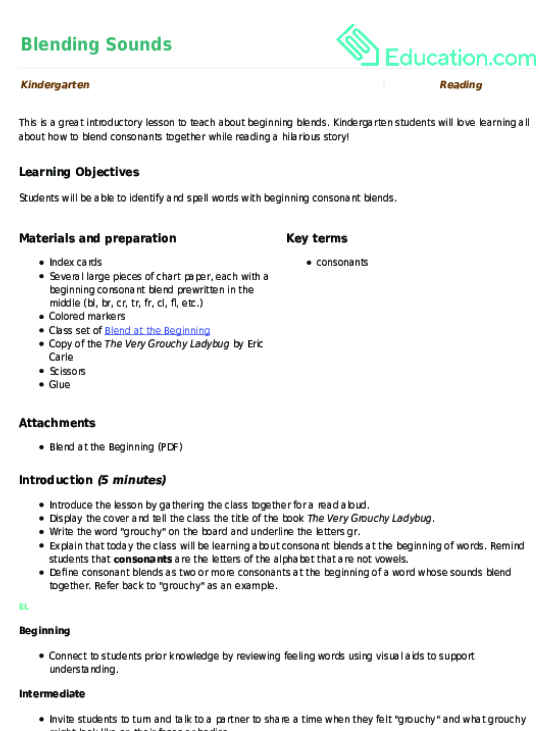 Using this page, students will be able to practise their writing skills in an authentic and meaningful way. Read aloud a hilarious story written from the perspective of a baby! Then use the story to launch your year one journal writing. Students will love creating their very own writing journals. Year one students will love learning all about how to blend consonants together while reading a hilarious story! Children put their reasoning skills to the test as they match workers to tools in this fun worksheet.